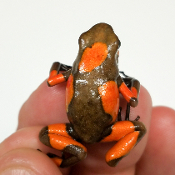 O. pumilio are very territorial, and will do best in pairs. Males can be very aggressive with each other and should be kept separately. Large vivariums (i.e >50 gallons) are highly recommended. There are very few of the 'Tado' morph in the US. They are not for beginners.